The Nigerian military has surrounded the whole of Biafraland and I can categorically confirm to the whole of humanity that We are under occupation. It is not their presence all over Biafraland that is a source of concern, it is rather the incessant harassment, intimidation and the wanton killings that these savages in uniform inflict on the masses that has got the people asking and wondering if Biafra land has become a war zone. 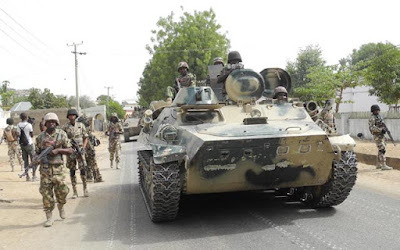 Our land has today become a land of military roadblocks, heavy loaded guns, Armoured Personnel Carrier (APC) display arena and gun trotting, battle ready, intimidation and harassment ready military officers. Our children and youths are now exposed to sights of guns as if there is a battle going on as well as sights of torture and intimidation of innocent Biafran citizens all in the name of providing security. However, what the military authorities have failed to explain is why we have so many road blocks and military presence in Biafra land where there is absolute no case of bombings and killings as currently witnessed in Southern Kaduna. Why is the military not in places that demand its urgent attention? Why is the military not in the North East Nigeria where Boko Haram are slaughtering as many innocent Christians without anyone stopping their activities? Why is it in Biafraland where there is no civil unrest? 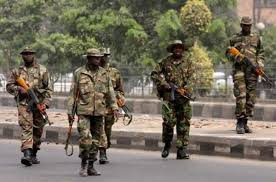 The military presence all over Biafraland is only but a way of invading our land with Boko Haram men in uniform disguised as military me because there is absolutely nothing to show that these soldiers are different from the Boko Haram terrorists wreaking havoc in the North. The so-called military officers have same modus operandi as the deadly sect. Their presence only brings sorrow and tears to the citizenry. Why must it be only in Biafra land that all the whole force we have in the contraption called Nigeria is directed? The above case even happened during broad daylight. Off course, one knows that the situation would have been different if it had happened in the night as it would have obviously ended in her execution and nothing would have happened. Pieces of evidence and examples of such execution abound in Biafra land. It includes the execution of Biafran activists and the carting away of the corpses to hide evidence and many others. However, the problem here is that the Army knowing that it is a rogue organization in Biafra land choose to intimidate, harass and threaten anyone who wants to come forward with such piece of information or evidence. Chidinma Chukwu, a resident who resides in Osisioma junction, Aba, Biafra land lamented of the atrocities she witnessed while still living beside one of the Army Barracks in Biafra land. She told gory stories of how Biafran youths were picked up at random and executed and buried in the cemetery inside the Army Barracks. Another resident of Aba, Sunday Emenike who lives at Brass Sreet, by Faulks road corroborated Chidinma Chukwu's story. He even said that one of such killings that he has personally witnessed that still makes him grasp for breath each time he remembers it is when army officers shot a taxi driver around 9 pm along Igweocha road without any reason. He witnessed everything that happened because he was fixing his faulty vehicle close to the scene of the crime. He believes that if these killer-Nigerian-Army-officers are not stopped urgently that it will embolden them to increase the impunity which will definitely have great and grave consequences. Biafra land is now a conquered territory and no one is saying anything. The Islamic Nigeria soldiers left the Borno State where Boko haram has taken most of that state, controls about 5 local areas, printed their currency, mounted their flags in several areas, and basically controls many villages and localities. The Islamic army left the burning north to occupy Biafra land with their war tanks which Obama gave to Buhari. And our elders, politicians, religious leaders, etc. are not talking. It's time to liberate our land and people from murderous Hausa-Fulani terrorist before it is too late. Once they enslave us, we all will be forced to convert to Islam. It happened to many countries - Egypt, Syria, Turkey, and to half of 54 countries today that are 100% Islamic. Nigeria will be completely Islamized one day.